The Biological Technologies Office (BTO) of the Defense Advanced Research Projects Agency (DARPA) is seeking innovative ideas to support the design of a potential Grand Challenge to leverage and advance DARPA investments in multidisciplinary predictive modeling of biological networks linked to cyclic/dynamic biological signatures and processes. The program, termed Biochoronicity, seeks to build on research which suggests it may be possible to diagnose and predict the state of human health and disease, including distinction between different clinical phenotypes and prediction of disease evolution, based primarily on bio-markers present in peripheral blood. 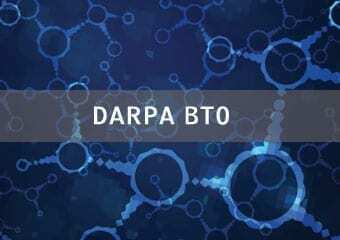 DARPA BTO is interested in novel concepts to enable quantitative diagnoses and prediction of human health and disease, resiliency, clinical phenotypes and disease trajectories based upon easily measured time-sampled molecular data, which may include but is not limited to RNA, DNA, protein, and metabolic profiles. In order to foster new and innovative ideas, DARPA is considering developing a Grand Challenge that will require the use of dynamic mathematical models that integrate multiple types of data across time to enable health and disease predictions. In such a challenge, participants would be provided with a set of clinical molecular data (e.g. genomic, proteomic and other data), and associated metadata (e.g. age of patients, physiologic measures) and asked to quantitatively predict patients’ health status and susceptibility to disease, and/or possibly provide early diagnoses of chronic disease. New modeling techniques employing the latest advances in mathematics, biology and information sciences would be encouraged. This RFI is specifically requesting information to help design the data collection, pre-analysis, and Challenge question formulation that would take place prior to announcing a potential Grand Challenge. DARPA is seeking compelling proof-of-principle for quantitative prediction of any or all of the following conditions: infectious diseases, chronic diseases, autoimmune diseases and/or neurodegenerative pathologies. Data collection that leverages ongoing studies or trials resulting in lower costs is encouraged. Total duration of the data collection phase including cohort management, data collection, pre-analyses of data and formulation of Challenge questions would be no longer than 12 months in duration. Further details are available under Solicitation Number: DARPA-SN-14-48. The response deadline is August 14, 2014.